In a recent post I looked at employment changes in New York’s metropolitan areas and compared their performance with other metropolitan areas in the rust belt. I found that change was inconsistent between cities in each state, and over different time periods. I argued that industry mix probably was the primary cause of the differing results. 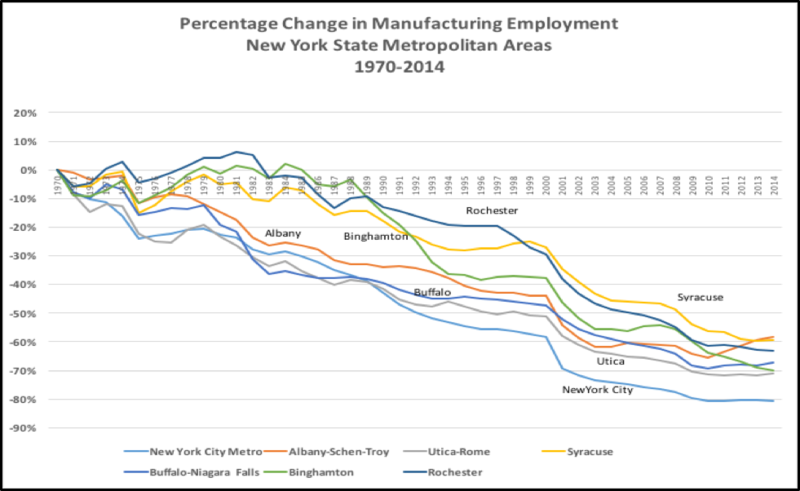 Here, I look at the decline of the manufacturing sector and its impact on employment change in New York State metropolitan areas. Overall, rust belt metropolitan areas in this study have 4,500,000 less manufacturing jobs today than they did in 1970, compared with 28.4 million private sector workers in that year. Overall, 1.2 million fewer people were employed in manufacturing in New York State in 2014 than in 1970, equal to 12.8% of the private sector employment total in 1970. In two metropolitan areas (Binghamton and Utica-Rome), manufacturing job losses were about one-quarter of private sector employment in 1970, while in Buffalo and Rochester the manufacturing losses were about 20% of the total. The loss of manufacturing jobs created a significant drag on job growth in the rust belt, and explains much of the growth of income inequality in the United States since the middle part of the last century. Manufacturing jobs provided working class people with relatively high incomes. Today, the opportunities that manufacturing provided to people with high school educations have sharply declined. Rochester provides a good example of the impact of the decline in manufacturing. 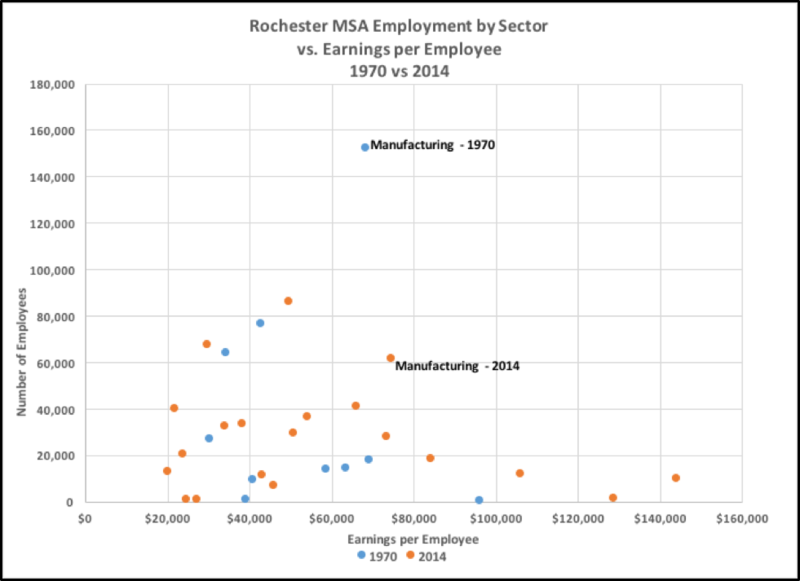 The chart above shows that in 1970, 152,000 people in the Rochester worked in industries in the manufacturing sector, with average earnings of $68,000 (in today’s dollars), compared with the regional average private sector earnings of $53,200. In 2014, 61,800 people worked in manufacturing industries in the area, with average earnings of $74,500, compared with regional average private sector earnings of $51,400. The loss of nearly 100,000 jobs paying significantly more than the regional average has large impact on Rochester and other rust belt metropolitan areas. In this section, aggregate data for all metropolitan areas each rust belt state is examined. 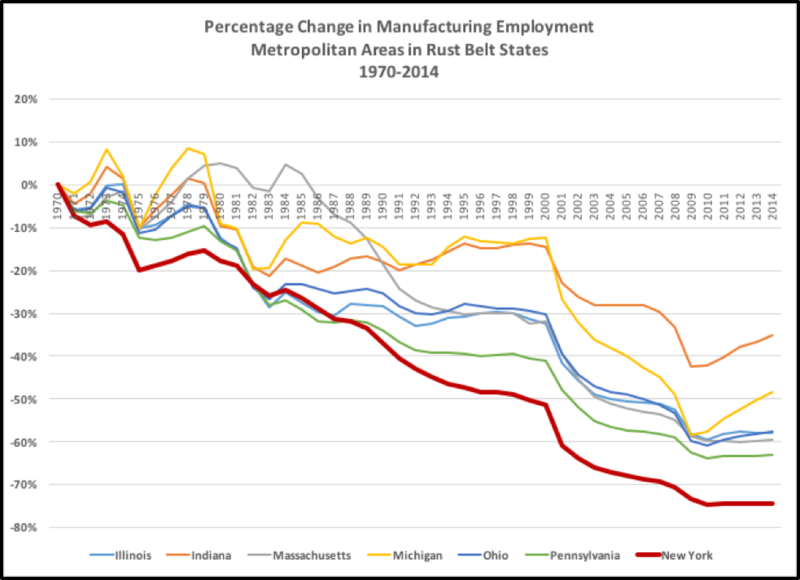 The data shows that while overall employment change in metropolitan areas was inconsistent over time, that between 1970 and 2014, manufacturing showed a larger decline in New York State than in metropolitan areas in other rust belt states. 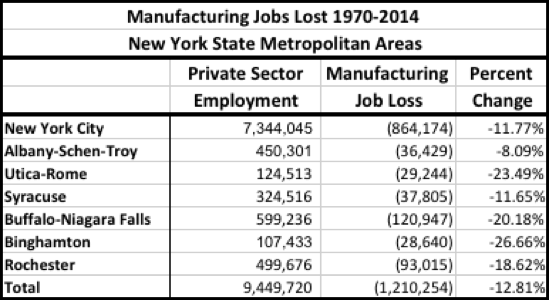 New York metropolitan areas have lost 75% of the manufacturing jobs that existed in 1970. Other rust belt states lost between 35% and 63%. (Note that in the data, there is a discontinuity between the years 2000 and 2001, reflecting the change from the Standard Industrial Code Classification System and the North American Industry Classification System, which removed some industries from the manufacturing sector. As a result, the long-term data charts and tables exaggerate the change that took place between 2000 and 2001. For that reason, shorter term charts and tables exclude the 2000-2001 data). Dividing that data into periods reflecting economic boom-bust cycles, there were significant differences in the relative performance of manufacturing in state metropolitan areas across economic cycles. However, manufacturing employment in New York metropolitan areas decreased more than most metropolitan areas in other rust belt states in most periods. Only in the 2007-2009 recession did it outperform the rust belt median. Between 1970 and 1976, between 1992 and 2000, and between 2001 and 2007 manufacturing employment performance in New York metropolitan areas was the worst of the seven rust belt states. Because more than two-thirds of New York residents live in the New York City Metropolitan area, the very large decrease in manufacturing employment in that area has had a disproportionate impact on the decline of manufacturing in the state. But, while upstate metropolitan areas had smaller percentage decreases in manufacturing employment that the New York Metropolitan area, they were more dependent on manufacturing. As a result, the loss of manufacturing jobs in those areas did more economic harm to them than the losses in the New York City area. Despite the large losses in manufacturing employment, each metropolitan area in New York State has shown some private sector employment growth since 1970, but the growth has been uneven. This data also makes clear that changes in manufacturing jobs are not the only factor driving employment change in metropolitan areas. Because so much employment is now in service sector industries, the performance of industries within the service sector has had substantial effects on the relative ability of metropolitan area employment to withstand the declines in manufacturing employment. As in other rust belt metropolitan areas, manufacturing employment in New York State metropolitan areas decreased during most periods. The patterns of the declines varied, with some metropolitan areas, like Rochester and Binghamton, doing quite well in the 1970’s and 1980’s but going into steep declines in the late 1980’s and 1990’s. Others, like Utica-Rome performed quite poorly in the 1970’s and 1980’s but performed better than other New York MSA’s in more recent periods. New York City’s manufacturing employment losses were consistently larger in percentage terms than average. In all the periods, every metropolitan area in New York State lost manufacturing employment, with the exception of the 2009-2015 period, where Albany-Schenecady-Troy gained 16%, and Buffalo-Niagara Falls gained 3.1%. While there were losses in manufacturing employment in each metropolitan area in each decade except the present one, the patterns of losses varied. New York City, Utica-Rome and Buffalo-Niagara Fall had losses that were greatest between 1970 and 1990. Binghamton and Rochester saw the largest losses between 1990 and 2010. Syracuse’s losses were largest between 2000 and 2010. Employment changes in non-manufacturing sectors in different decades led to sharply varying results. For example, despite losing 36,600 manufacturing jobs between 1980 and 1990, Buffalo-Niagara Falls had a net gain of 48,400 jobs during the period, because non-manufacturing employment increased by 85,000. From 2001 to 2010, Buffalo-Niagara Falls lost 30,600 manufacturing jobs, but gained only 24,600 non-manufacturing jobs. As a result, the area lost private sector employment in that decade. Rochester and Syracuse also performed well during the 1970 to 1990 period but did poorly during the first decade of this century. In contrast, The New York City metropolitan area lost employment during the 1970’s, but has steadily gained strength since then. Since 2001, two New York metropolitan areas have shown significant private sector employment growth – New York City and Albany-Schenectady-Troy. Buffalo, Rochester and Syracuse did not do well between 2001 and 2010, but showed significant recoveries from 2010 to 2014. Binghamton and Utica-Rome had employment losses in the 2001 to 2014 period. Overall, 1.2 million fewer people were employed in manufacturing in New York State in 2014 than in 1970, equal to 12.8% of the private sector employment total in 1970. 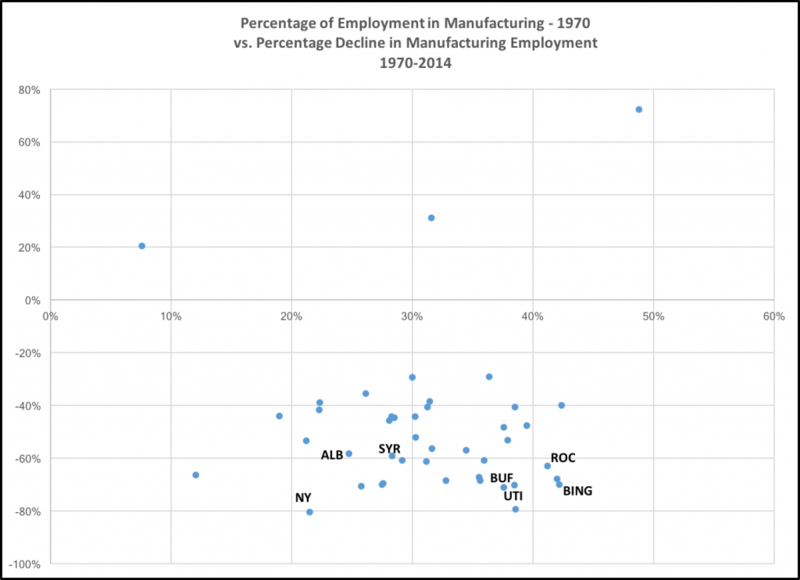 New York’s metropolitan areas each had substantial declines in manufacturing employment between 1970 and 2014. Binghamton lost the highest percentage (26.66%) of manufacturing jobs compared with its private sector employment in 1970. Albany-Schenectady-Troy, which lost 8.1%, was the least affected. Over the 44-year period between 1970 and 2014, manufacturing employment in New York State metropolitan areas both declined and converged. Four metropolitan areas had significantly higher percentages of manufacturing employees compared to private sector employment in 1970 than the rust belt average: Binghamton, Buffalo-Niagara Falls, Rochester, and Utica-Rome. In 1970, more than four of ten private sector employees in the Rochester and Binghamton metropolitan areas were in manufacturing. More than 35% worked for manufacturers in Buffalo-Niagara Falls and Utica-Rome. Each of these metropolitan areas had larger decreases in the percentage of manufacturing employment than the average. New York, and Albany-Schenectady-Troy had the lowest percentages of manufacturing employment in 1970 – 21.5% and 24.7% respectively, and had the smallest long-term declines – 18.7% and 19%. Note, however, that when metropolitan areas with similar concentrations of manufacturing employment are compared (see below), much of the difference in performance between New York metropolitan areas and other rust belt locations disappears. In 2014, the areas with the highest percentages of manufacturing employment – Binghamton and Rochester – had only 11.4% and 10.9%. Only 2.9% of private sector employees in the New York metropolitan area and 5.8% of those in the Albany-Schenectady-Troy metropolitan area were employed in Manufacturing. By 2014, only Binghamton, Rochester and Buffalo-Niagara Falls had higher percentages of manufacturing employment than the rust belt average. The percentage of manufacturing employment in these two metropolitan areas exceeded the rust belt average by less than 2%, compared with 7% to 9% in 1970. Manufacturing and private sector employment change each varied substantially from decade to decade, but the relationship between the two was not constant. Clearly, the decade from 2001 to 2010 was the worst decade for employment change in upstate New York, both for the private sector and for manufacturing. On the average, more nearly one-third of manufacturing employees were lost during that decade, while overall, private sector employment declined by 1.7% on average. From the perspective of manufacturing employment, 1980 to 1990 was the second worst decade in the period, but private sector employment had the second highest growth of the five time periods. Rochester and Syracuse had the strongest private sector growth between 1970 and 1990, but showed little growth after 2000. New York City’s employment growth was the weakest in the state between 1970 and 1990 but among the strongest since 2001. Overall, metropolitan areas in the rust belt that had relatively greater percentages of private sector employment in manufacturing in 1970 lost a greater share of manufacturing employment than other areas with lower initial manufacturing employment concentrations. The data shows that metropolitan areas in New York State performed similarly to others with similar concentrations of employment in manufacturing industries. 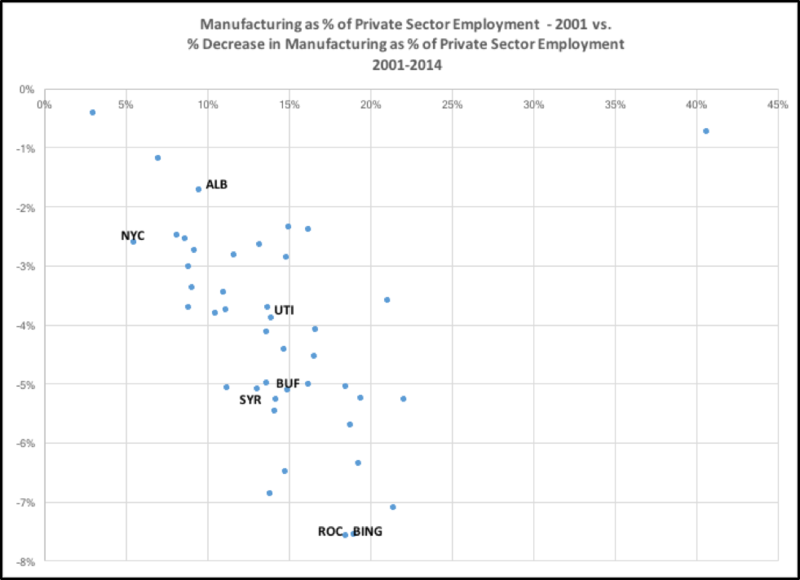 Buffalo, Rochester, Binghamton and Utica-Rome had both the highest concentrations of manufacturing employment and the greatest declines in the share of private sector employment in manufacturing. Between 2001 and 2014, the relationship between manufacturing’s share of private sector employment and the decline in the manufacturing share of employment was weaker, but still present. In general, areas that had higher concentrations of manufacturing employment in 2001 had greater decreases in the concentration of manufacturing employment than those with lower concentrations. Once again, metropolitan areas in New York State generally performed in a similar manner to those in the rust belt outside New York having similar concentrations of manufacturing employment. The data in both periods points to the steep decline in manufacturing employment from an average of more than three in ten private sector jobs to an average of one in seven. 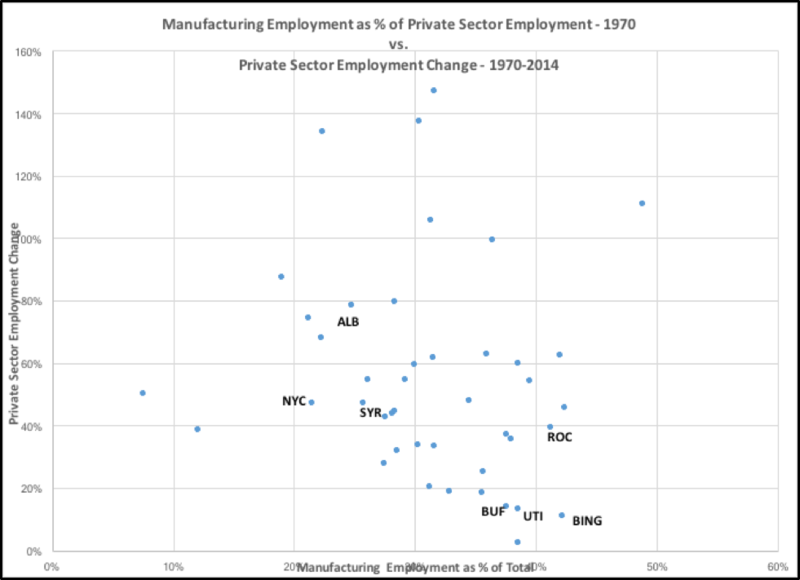 With the decline came a convergence of manufacturing employment in metropolitan areas, with the range in the percentage of private sector employment in manufacturing ranging from about 20% to 40% in 1970, compared with 5% to 20% in 2014. Here, the percentage decrease in manufacturing employment is compared with the initial share of private sector employment in manufacturing industries. The data shows little relationship between these two factors. Over the 1970-2014, and in the 2001 to 2014 period, metropolitan areas in New York State performed relatively poorly compared to others in the rust belt. 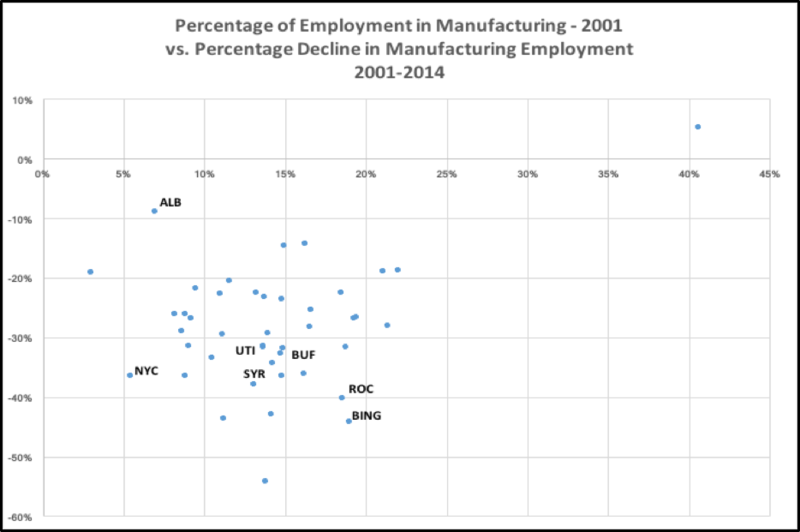 However, over the more recent period from 2001 to 2014, New York metropolitan areas, other than New York City saw percentage decreases in manufacturing employment that were closer to other rust belt cities with similar concentrations of employment in manufacturing. In this section, the percentage of total private sector employment in manufacturing industries is compared with private sector employment change. 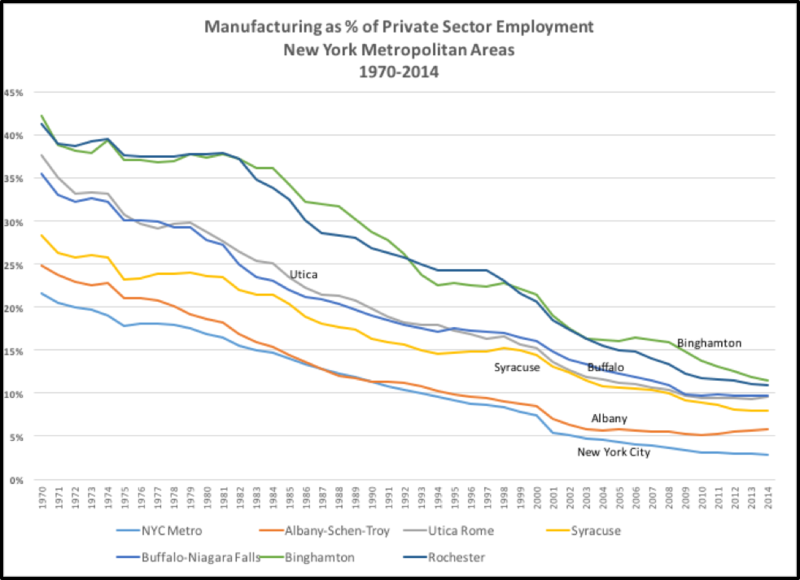 Between 1970 and 2014 overall, Albany-Schenectady-Troy had better performance than metropolitan areas with similar concentrations of manufacturing employment in 1970. Syracuse and Rochesster were near the average. Most metropolitan areas in New York State performed better in the 2001 -2014 period relative to other rust belt metros than they did in the longer term period, Binghamton being a notable exception. The New York City metropolitan area had the best job creation performance of the rust belt metropolitan areas studied. Note also that the charts above show that when New York’s metropolitan areas are compared with other rust belt areas with similar concentrations of manufacturing employment, much of the apparent worse employment performance of New York metropolitan areas described in an earlier section disappears. 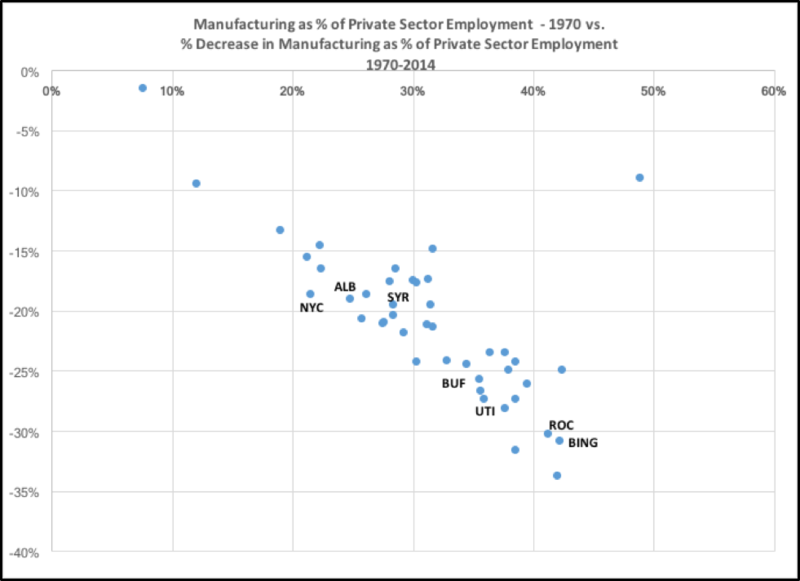 Over the 1970 to 2014 period, percentage decreases in manufacturing employment did not show an association with private sector employment change for the rust belt . However, metropolitan areas in New York State performed somewhat differently: Areas with higher concentrations of manufacturing employment in 1970 showed less private sector employment growth than those with lower concentrations. Similarly, in 2014, for the rust belt overall, there was not a significant relationship between the concentration of employment in manufacturing industries and private sector growth. In that period, in New York State, areas with lower concentrations of manufacturing had greater private sector growth. 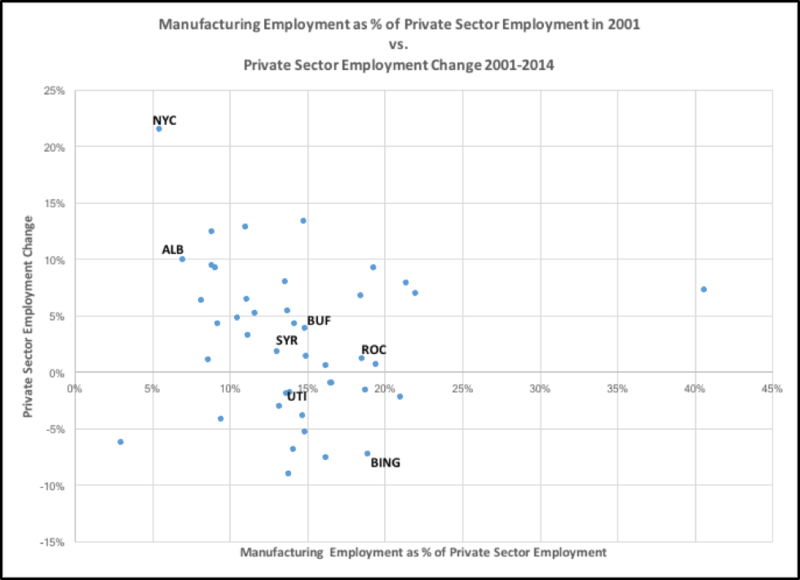 New York City had the greatest percentage growth in private sector employment during the period along with a low percentage of manufacturing employment. 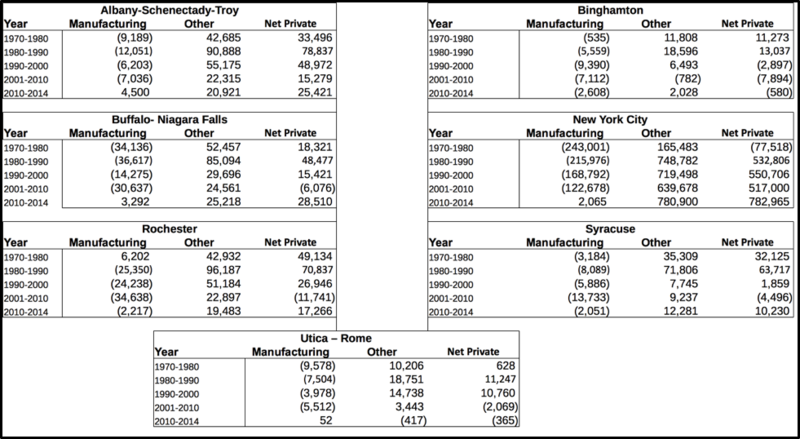 Albany-Schenectady-Troy was another metropolitan area with relatively little manufacturing employment in 2001 and relatively high private sector employment growth. Since 1970, New York and the rust belt region have seen a substantial transition from high concentrations of manufacturing employment to lower ones. In 1970, one third of all private sector jobs in the rust belt outside New York State, and more than 40% of private sector jobs in Rochester and Binghamton were in manufacturing. In 2014, manufacturing employment in New York State metropolitan areas ranged from 2.8 to 11.4% of private sector jobs. Since 2010, manufacturing employment has levelled off. Whether this is a lasting change or a temporary stabilization after the very large manufacturing employment losses between 2000 and 2010 is not known. This data shows that much of New York’s relatively large manufacturing employment loss resulted from the fact that a number of upstate cities had higher concentrations of manufacturing than average for the rust belt. In New York, unlike metropolitan areas elsewhere in the rust belt, private sector employment growth appeared to be negatively related to the level of employment in the manufacturing sector. All of the metropolitan areas in the rust belt were hurt by technological change, factory automation and the movement of manufacturing off-shore. These trends reflect the continuing attempt of manufacturers to cut costs to be competitive. In addition, the New York and the rust belt are no longer as good location to serve markets as they were when manufacturers in the United States primarily served domestic markets. For those manufacturers that find it advantageous to serve domestic markets from the United States, the center of population has continued to move South and West. Manufacturing employment losses in New York State had differing causes. In Rochester, Kodak was initially threatened from foreign competition by Fuji, then saw its cash cow (film production) killed by the introduction of digital cameras. In Syracuse, New Process Gear was closed by Fiat/Chrysler because of high labor costs. Production continued at factories in Indiana and Tennessee, locations with lower labor costs and better geographic locations. Carrier moved production of air conditioners from Syracuse to Tennessee, Texas, and Indiana (now being transferred to Mexico) for the same reasons. Given transportation costs, the need for quick delivery of some products, and in a few cases technological leadership, some manufacturing continues in the United States. In the competition to retain manufacturing, New York may continue to be handicapped by its location in the Northeast, its relatively high labor costs, and congestion in the New York metropolitan areas. Future losses of manufacturing jobs have a smaller potential to harm regional economies because manufacturing employment is now only a small portion of private sector employment in the rust belt and New York State. But, the loss of millions of relatively high paying jobs in manufacturing industries has had significant negative consequences for New York and rust belt metropolitan areas. In New York, the decline of manufacturing has been a cause of private sector employment declines in places like Binghamton and Utica-Rome, and slow growth in Rochester, Syracuse and Buffalo-Niagara Falls. And, though employee earnings are not the primary subject of this post, data from Rochester showed that the loss of 93,000 manufacturing jobs contributed to the stagnation in average private sector earnings in that metropolitan area, as well as greater earnings inequality. In future posts I will examine employment change in service industries, and implications for metropolitan area wages. The data for this post is from the Economic Profile System at www.headwaterseconomics.org and the U. S. Department of Commerce, Bureau of Economic Accounts, Regional Economic Accounts. Periods were broken between 2000 and 2001 because of the change from the SIC to NAICS classification system, which creates a discontinuity because of changes in firms classified as manufacturers. Metropolitan areas included in rust belt comparison: Illinois: Champaign-Urbana, Chicago, Peoria, Rockford, Springfield; Indiana: Elkhart, Evansville, Fort Wayne, Gary, Indianapolis; Massachusetts: Boston, Springfield, Worcester; Michigan: Ann Arbor, Detroit, Flint, Grand Rapids, Kalamazoo, Lansing; New York: Albany-Schenectady-Troy, Binghamton, Buffalo-Niagara Falls, New York City, Rochester, Syracuse, Utica; Ohio: Akron, Canton, Cincinnati, Cleveland, Columbus, Dayton, Toledo, Youngstown; Pennsylvania: Allentown-Bethlehem-Easton, Erie, Harrisburg, Lancaster, Philadelphia, Pittsburgh, Reading, Scranton-Wilkes-Barre, York.